Rebecca Kiss/Photography Editor Graduate student middle hitter Lexi LaGoy tallied eight blocks and 11 kills, including the game-winner, in BU’s victory over Siena. 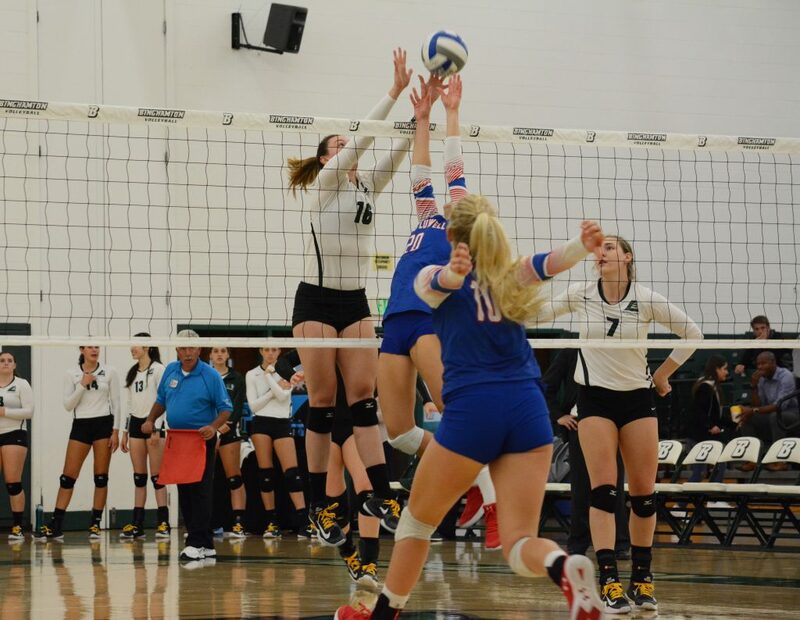 The Binghamton volleyball team was defeated in all three of its matches in the Wyoming tournament this weekend. This performance tacks on an additional three losses to what has already been a winless season for the Bearcats — that is, until Tuesday’s match against Siena College, which BU (1-9) took in five nail-biting sets. On Friday afternoon, the Bearcats began the tournament with a match against the University of Wyoming. The Cowgirls (8-1) downed BU in three sets, the first of three straight wins that they enjoyed this weekend during their participation in the UniWyo Invite. It was a one-sided match, as the Cowgirls made it difficult for Binghamton to find an edge. They took the first set 25-9, the second 25-15 and the third and final set 25-12. Senior outside hitter Gaby Alicea led the Bearcats with 9.5 points during the opening game. Later that evening, the Bearcats took on Murray State University. This match featured the Racers (5-4) overpowering BU in three sets. Murray State started the match strong, taking set one 25-15 and set two 25-12. In set three, Binghamton came out with an early lead and managed to keep the score to within a few points for most of the set. It wasn’t until the set’s concluding points that the Racers took control, ending it 25-21. Senior outside hitter Erin Shultz led the Bearcats with nine points on nine kills. On Saturday, Binghamton participated in its final match of the tournament, facing off against Arizona State University. In this match, the Sun Devils (7-2) defeated BU in three straight sets. Both teams fought hard in every frame, but each ended with a comfortable victory for Arizona State. Alicea led the Bearcats with 15 points on 14 kills in BU’s seventh consecutive sweep. On Tuesday, the Bearcats traveled to Loudonville, New York, where they played Siena College (1-9). BU triumphed over the Saints, taking the match in five contested sequences. In the first set, Siena came out firing, scoring nine unanswered points. A service error and then a ball handling error from Siena sophomore setter Jessica Eblin got Binghamton its first two points of the match. BU managed 10 points during the set, including six kills and one service ace. Set two was far more competitive at a point when Binghamton seemed to be on a familiar road of being swept. Although the Saints came out with an early advantage, BU was not ready to go down without a fight, scoring point after point to overcome what had been at most a six-point deficit. The teams traded leads as either one fought hard to take the frame, which saw eight ties and four lead changes. The sequence set ended in Siena’s favor, as the Saints overcame the Bearcats, 25-23. In the third set, Siena scored six unanswered points for an early lead. Following a timeout, Binghamton rallied back hard, tying twice before finally gaining a five-point lead. While the Saints did their best to catch up, BU held onto its advantage throughout the set, taking it 25-21. This frame marked the first time in 24 sequences that BU came out on top. During set four, both teams battled in what was another elimination round. Right out of the gate, neither team had the upper hand, going point-for-point until the very end. Back-to-back kills made for a nail-biter of a set, as a kill from Alicea tied it at 25. The teams exchanged points until BU finally took the set 30-28 courtesy of a kill from Shultz and then an attack error by Siena. The Bearcats overcame their opponent in set five, taking it 15-11 with the game-winning point coming via a kill by graduate student middle hitter Lexi LaGoy. Alicea ended the game with a career high in kills, a performance that included her 1,000th career kill. The Bearcats will kick off the Sacred Heart Hampton Inn Invitational on Friday, Sept. 14 as they take on the University of Rhode Island. First serve is scheduled for 4 p.m. from the William H. Pitt Center in Fairfield, Connecticut.